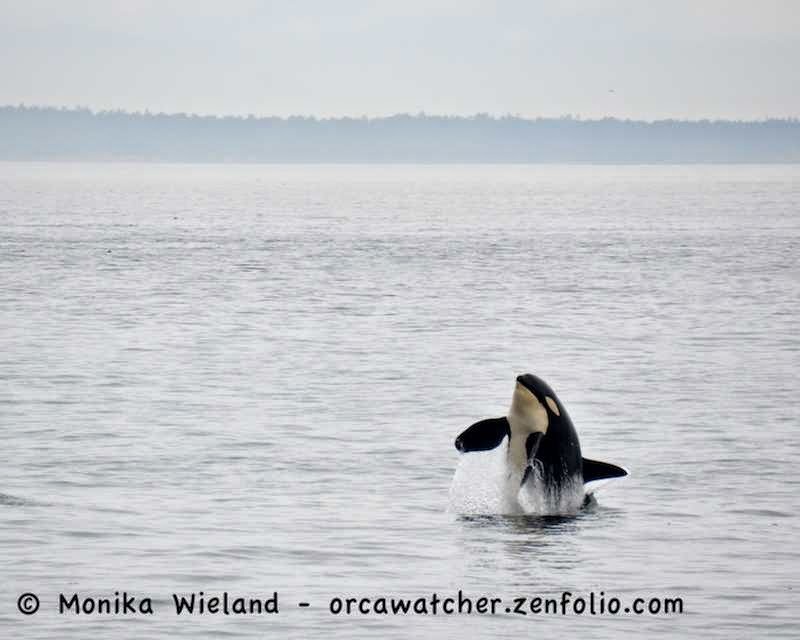 Orca Watcher: July 5: Superpod! The weather slowly deteriorated until three hours later it was raining pretty good. Hungry, and with still no sign of residents, I decided to head home to get something to eat. 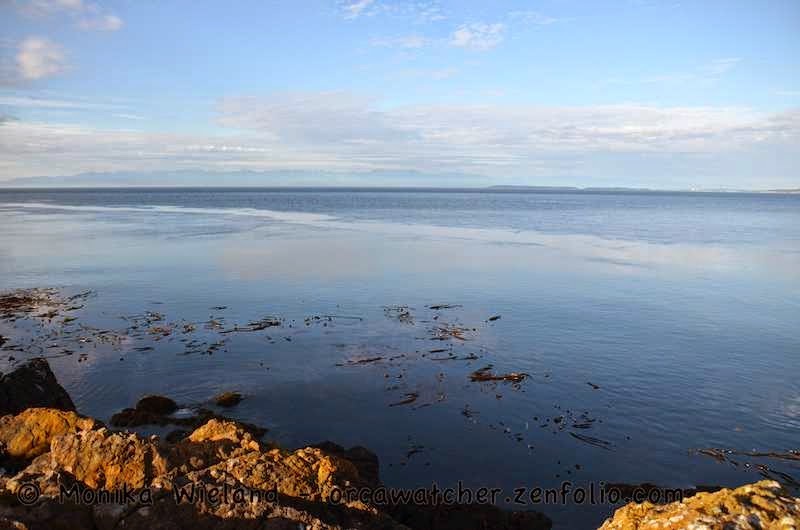 I was only home about an hour when I heard that residents were crossing Haro Strait, having swept out west the night before. Time to get back out there! 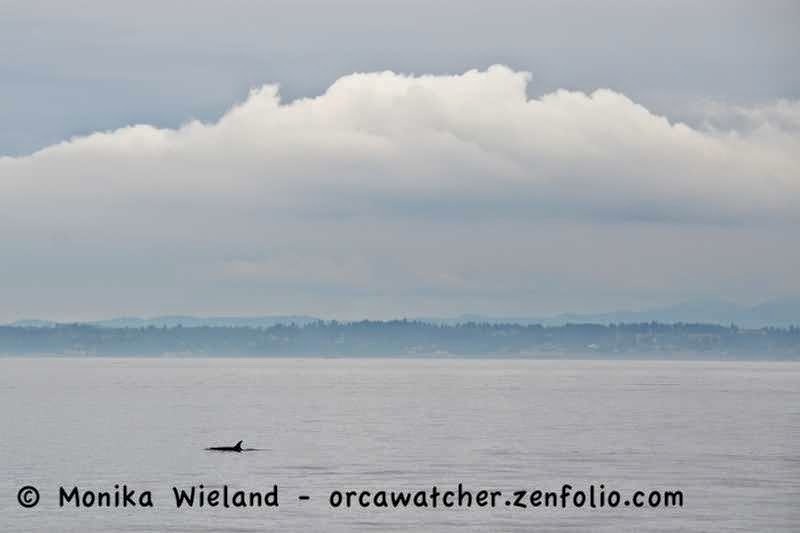 I got to Lime Kiln just as the whales did. 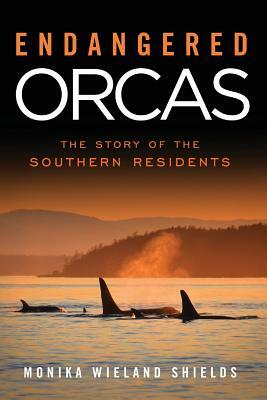 I've seen some very lucky kayakers get some great experiences with orcas this week. 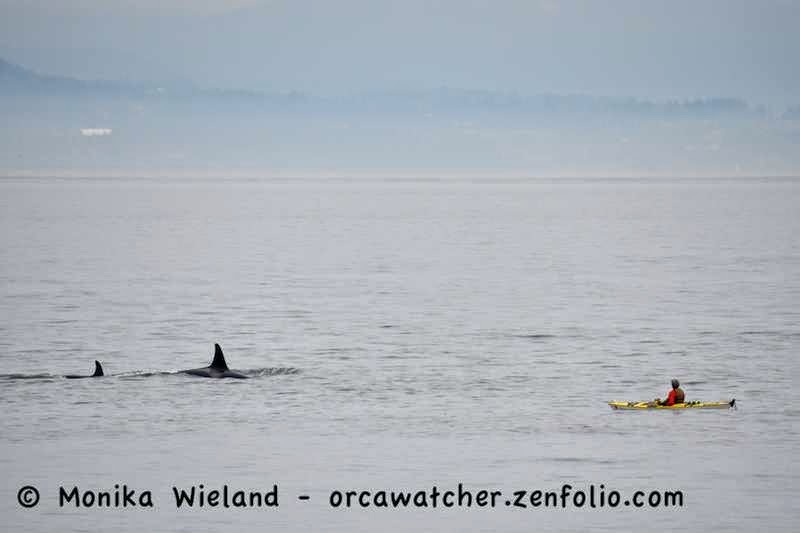 While many have the dream of kayaking with orcas, it's important to remember that moments like these are not typical! While I had been one of only two cars in the parking lot first thing in the morning when the Ts went by, when I arrived at Lime Kiln this time, there were no parking spaces open at all! 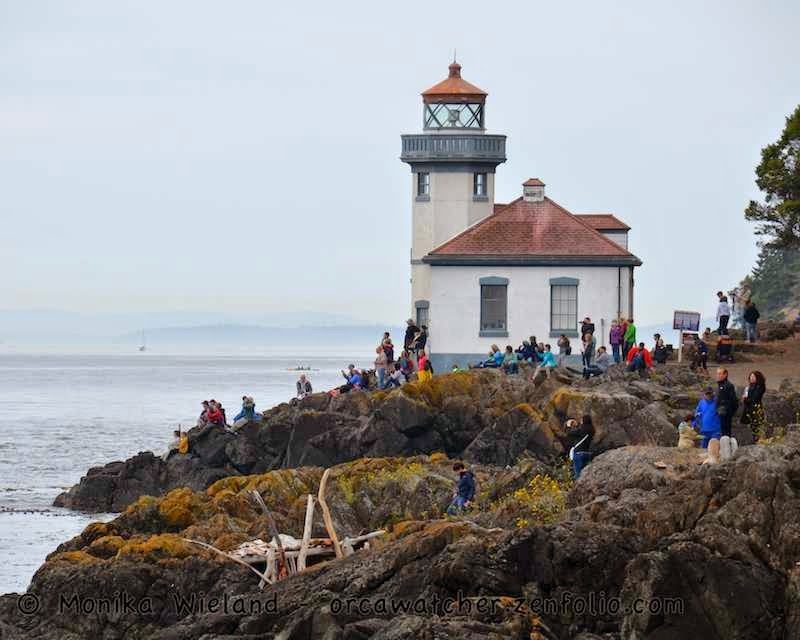 The shoreline was packed on this holiday weekend, despite the continuing drizzle. 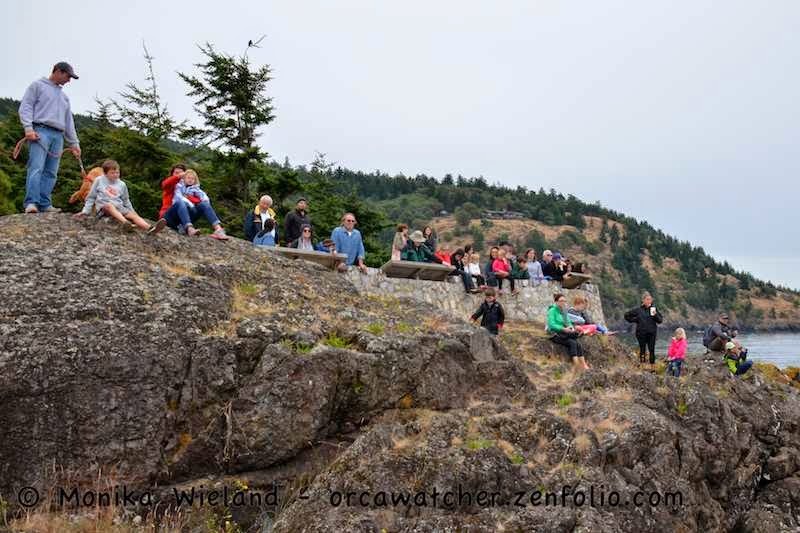 Shore-based whale watchers at "Whale Watch Point"
All three pods were around, and I saw members of every pod, but it was mostly Ks I was seeing off Lime Kiln. 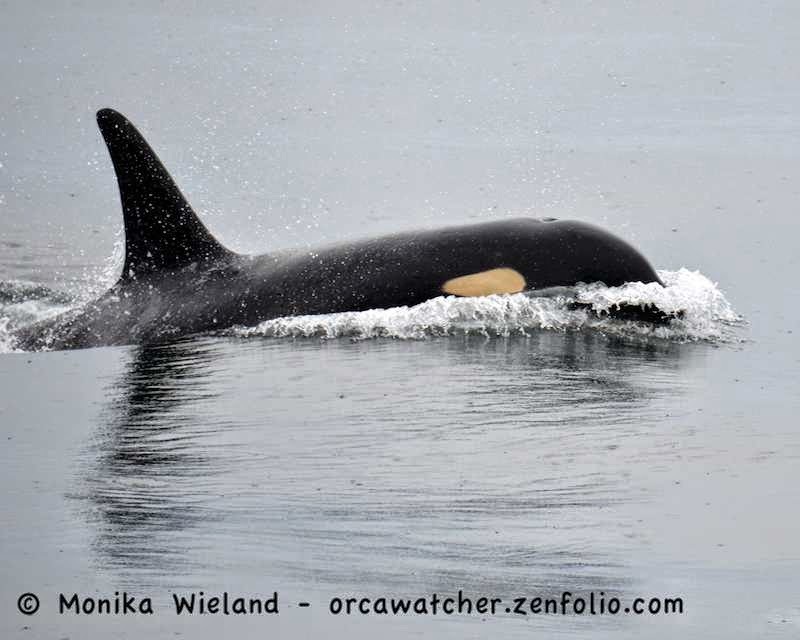 As K20 Spock came by, she did three spectacular breaches! I love this next shot - while she's facing "away" from the camera, you can see both of her open saddle patches! 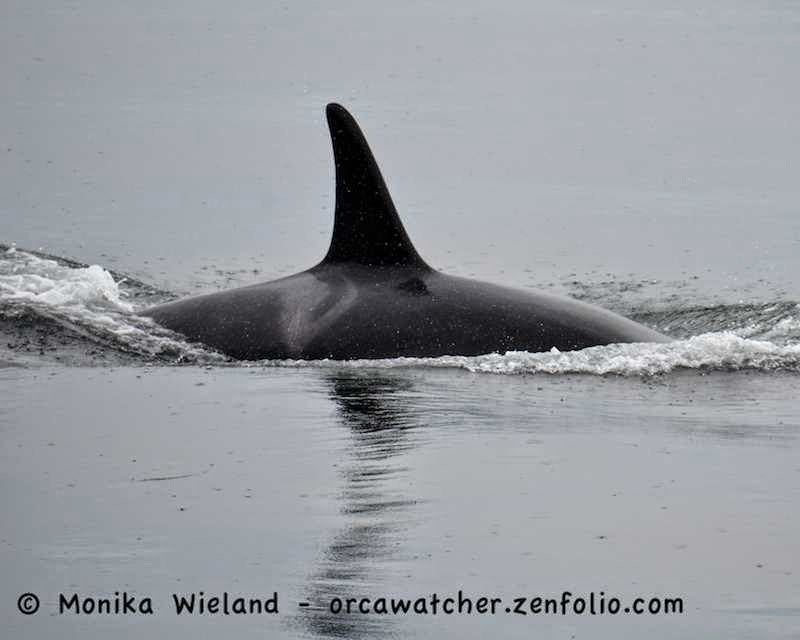 A bit later Spock's younger brother K34 Cali came by really close to shore! I love the reflections. 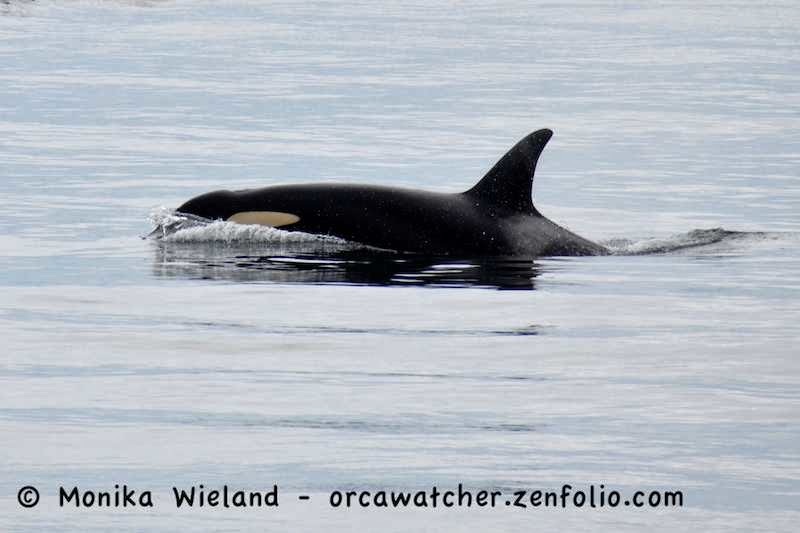 An hour and a half later, not all the whales had passed us, but there was a turnaround as everyone did an about face and started going south again, I was assuming to meet up with J-Pod "Group A" who was coming down Rosario Strait. 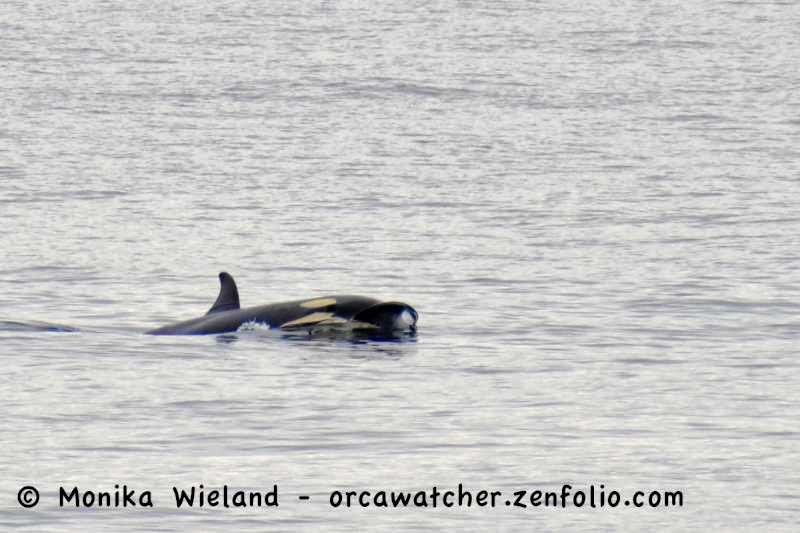 (Note: I think the only other whales not present were the L12 sub-group, the L54s, L84, and L88.) 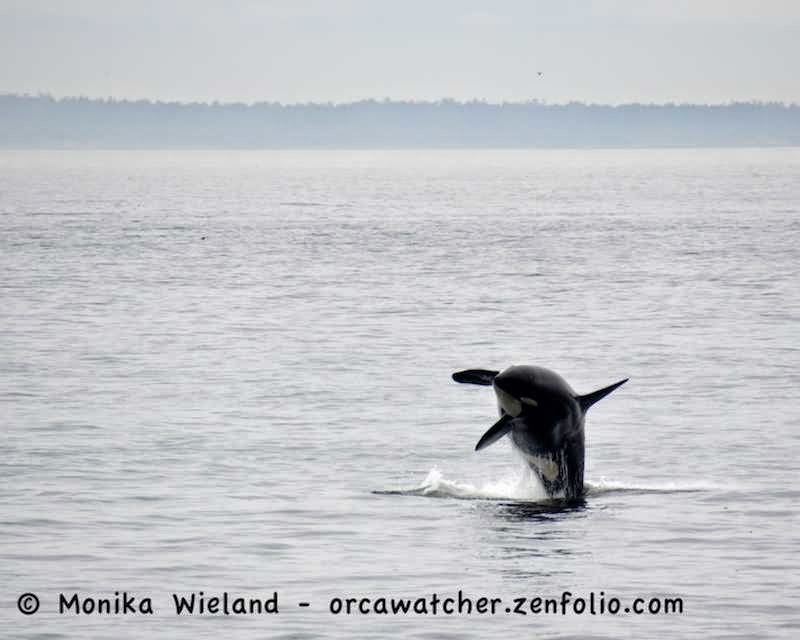 As the whales traveled south, L116 Finn (age 4) stopped to do some foraging. 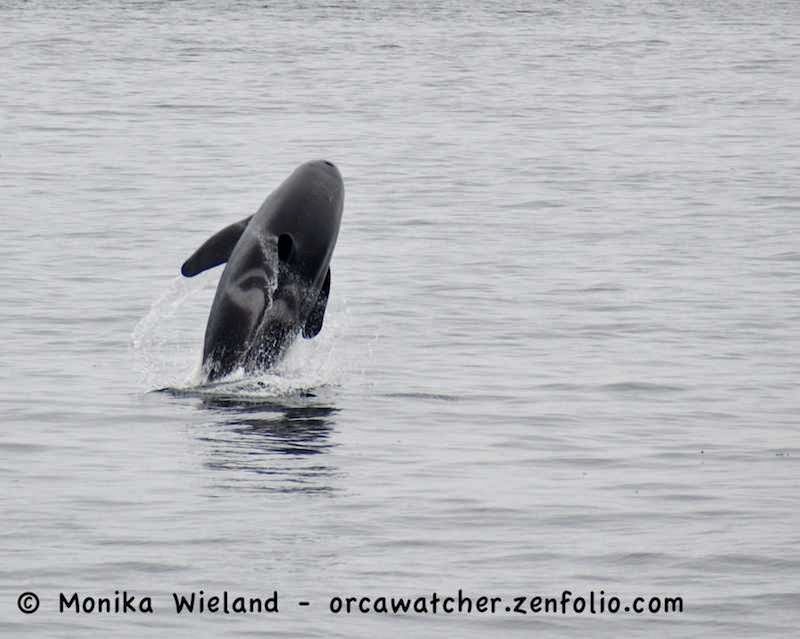 I thought it showed up in one of my photos, but it didn't very clearly - he was pushing a salmon around at the surface. 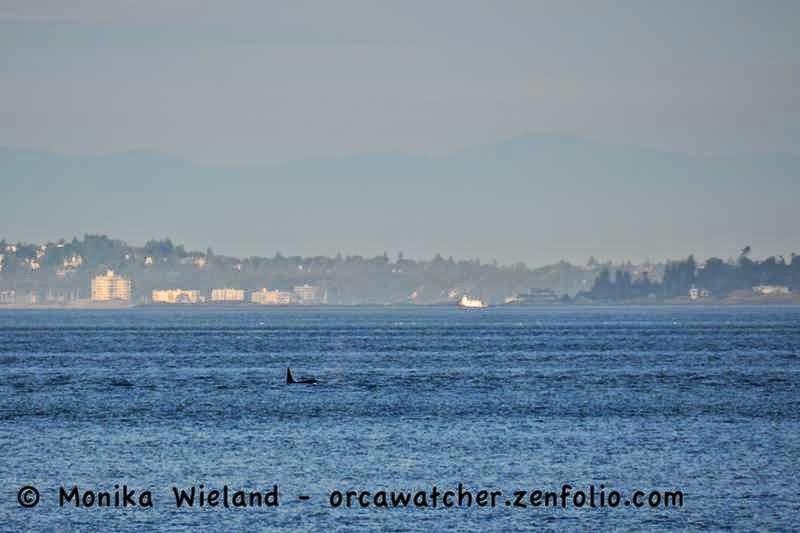 The last whales that came by did so quickly, perhaps trying to catch up to everybody else. 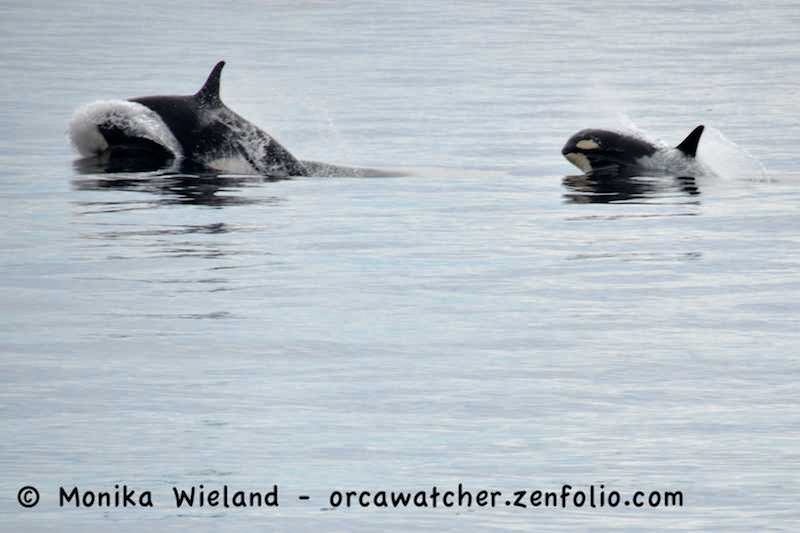 It's hard to get good photos of porpoising whales - they were almost out of the frame on this shutter click!